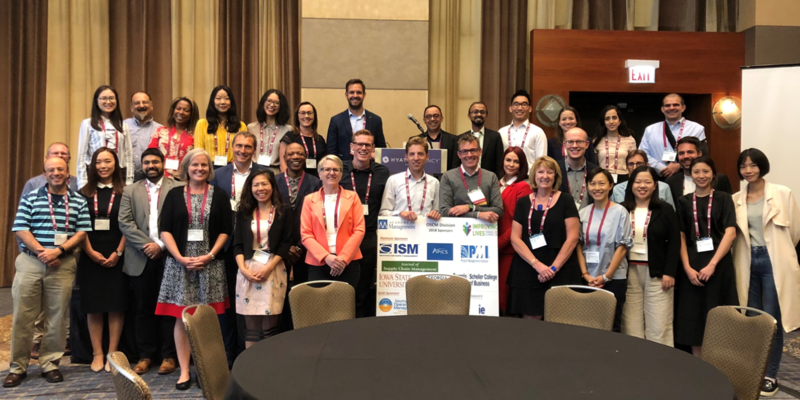 The Operations and Supply Chain Management Division is proud to announce a joint Junior Faculty and Doctoral Consortium at the Annual Meeting of the Academy of Management (AoM) in Boston, MA, USA. This event will be held from 9:30 AM to 5:30 PM on Friday, August 9th, 2019. This consortium has been a regular feature of the division’s conference program, and has been instrumental in assisting doctoral students and junior faculty in furthering their research and building their professional network with peers and senior faculty. The primary focus of the joint consortium involves an intensive research incubator session for doctoral students and junior faculty. Doctoral students are asked to give a short (15 minute) presentation about their research proposal to a panel of senior and junior faculty who then provide feedback and guidance on each proposal. Subsequently, the junior faculty will have an opportunity to present their research programs describing how they are extending their dissertation research and/or starting new research streams. The doctoral students are expected to ask questions and learn about building a research identity. In addition to the research incubator session, several panel sessions will further elaborate on publishing and the development of research streams. Experts in the field are invited to provide their input and engage participants in Q&A sessions. Doctoral students and junior faculty doing research on any OSCM topic may participate. However, preference will be given to students and junior faculty employing empirical research techniques. Students who have attended other conferences’ doctoral consortia find this consortium uniquely beneficial due to its intensive focus on developing research. In our format, junior faculty are put in a unique position of receiving advice from senior faculty as well as acting as mentors for doctoral students. The consortium coordinators are Kai Förstl (kai.foerstl@ggs.de) for the junior faculty and John Macdonald (john.macdonald@colostate.edu) for the doctoral students. If you are interested in attending the Joint Junior Faculty and Doctoral Consortium, please send your application by e-mail to the relevant coordinator by April 14, 2019. Applications will be acknowledged via email by May. The consortium is a pre-registration event; all attendees must pre-register in accordance with these instructions. Applications should include: (i) a cover letter including your full contact information, your advisor’s full contact information (doctoral students only), and a one-sentence statement on your stage in the doctoral program (doctoral students only), (ii) a current vita, and (iii) a one-page summary of your dissertation research (doctoral students only) / research prospectus (junior faculty only). Doctoral students should also indicate whether they apply for a travel grant from the OSCM Division Student Assistance Fund. (If interested, see the details in the OSCM Endowment Charter). Any senior faculty interested in mentoring please contact either coordinator. For any questions, please contact Kai Förstl (kai.foerstl@ggs.de) or John Macdonald (john.macdonald@colostate.edu).